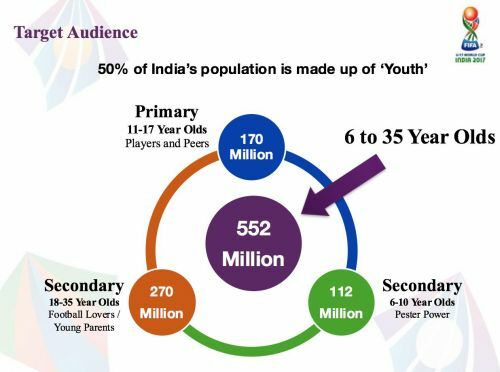 A six-part on-demand series of excerpts from - India playing host to the most attended FIFA Youth World Cup in history. This is part-three. Catch up on part-one and part-two. Six venues, 52 matches and just over 1.4 million seats to be filled across 16 match-days. 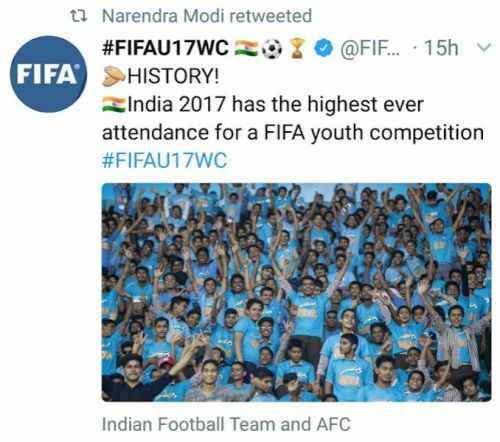 We always knew India has the numbers but does India have the football audience to make India’s first World Cup one for the history books? 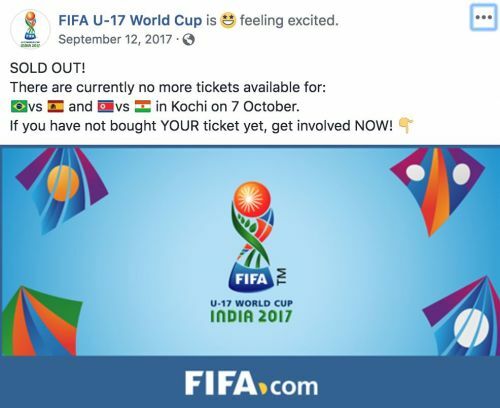 Given that it ended being the most attended FIFA youth tournament (U-17/U-20 World Cup) ever, the immediate answer would be ‘Yes’ though what did we (Local Organising Committee) do differently? Well, you are about to find out. Our first meeting as a team of five including our two directors was in September 2015, 25 months before the start of the tournament. It was very clear to all of us the impact that the first FIFA World Cup could have on the sports industry in India as well as the way the country will be portrayed across the 200 plus member nations of the international football federation. The thought and picture of any match seen on global television without any spectators are probably what scared us the most. Our fear along with the compulsive passion to make it a success ensured that ‘full stadiums’ was the goal of every person and stakeholder involved in this tournament. A book called ‘Influence: The Psychology of Persuasion’ by Robert Cialdini talks about 7 key influencers of persuasion: weapons of influence (aka the reason why), reciprocation, commitment & consistency, social proof, liking, authority and scarcity. 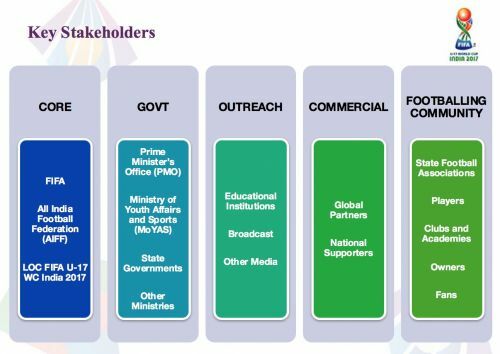 Using almost all of these (not necessarily in any particular order) with all our stakeholders, we managed to devise an all-encompassing marketing plan starting from November 2015 all the way till the final on 28th October 2017. We knew from the start that this wasn’t just about getting bums-on-seats but was an opportunity to engage (across all mediums) a much larger audience that included young families altogether coming out to support football. 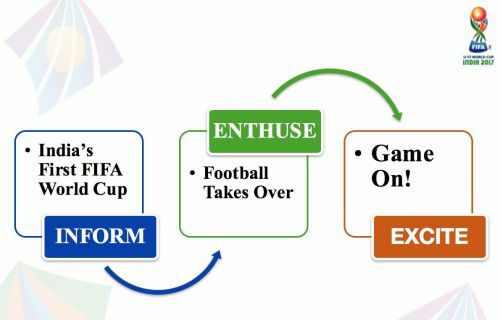 On 9th November 2015, we made our first move with a campaign focused event called #IndiaTakesOver, targeted at the low hanging fruit (football fraternity) by arousing national pride and interest. On the occasion of the previous edition ending in Chile and the baton being handed over to India, we got together three generations of Indian national team captains – Past: Chuni Goswami/Baichung Bhutia, Present: Sunil Chhetri, Future: Amarjeet Singh (U-17 Captain). The focus for us was and continued to be football. This marked the start of our ‘Inform phase’ and much to our delight saw a great deal of coverage across mainstream media as well as support on social media. All our energy in every event and campaign going forward was focused on keeping things in-line with our over-arching plan as well as the eventuality of filling the stadium come tournament time. 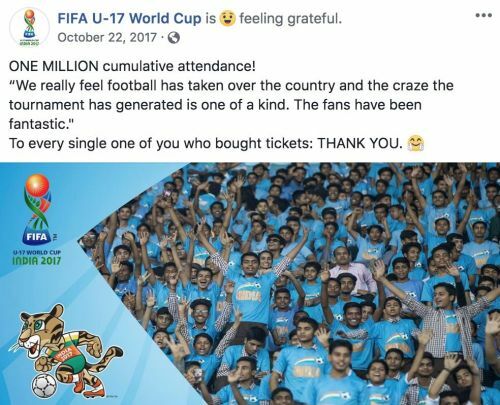 March 2016 we witnessed the Prime Minister of India reach out to the masses via radio and social media to ask for support as well as involvement to make the U-17 World Cup a country-wide celebration of football. In May the same year, the Prime Minister reinforced his message on the radio show alongside our effort to speak to a cricket-inclined audience on the television pre-show of the Indian Premier League (IPL) semi-final with Baichung Bhutia and the U-17 Head Coach as guest stars on the show. The last event of this first phase was the India 2017 emblem launch that saw the FIFA President himself unveil the emblem that gave our tournament an identity to showcase and promote over the next twelve months. Why are we doing what we are doing? And who should be interested? A tournament of national importance and a potential game-changer for sports in the country and across the globe. All Indians (especially sports-lovers) along with football-lovers worldwide need to stay tuned and keep an eye out for more. Using the perceived authority of people spreading our message, we were able to gain mass national appeal leading up to the next phase of our plan. This appeal was not restricted to only individuals but was pertinent to organisations part of our stakeholder matrix as well. There was no better way to start the ‘Enthuse phase’ of our plan than with the introduction of our official Mascot – ‘KHELEO’ (Will tell you a little bit more about his conceptualisation in the next part of this series). A mascot that was targeted very much at our primary audience and whom we planned to use in every event and announcement then on as well as across all the Mission Eleven Million festivals across the country. 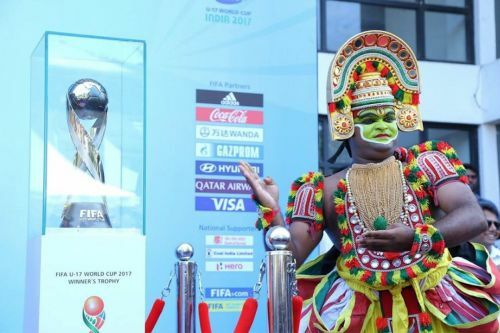 The mascot launch was followed by events in quick succession in March 2017: Volunteer registration (more than 8000 applications in the first six hours that led to a total of 30,000 plus applications for just 1500 spots), #FootballTakesOver (Official Slogan) launch and unveiling of the match schedule (that defined which cities played host to which matches). The biggest event in this phase was the Ticketing Launch, pretty much the one moment all our efforts culminated to thus far. 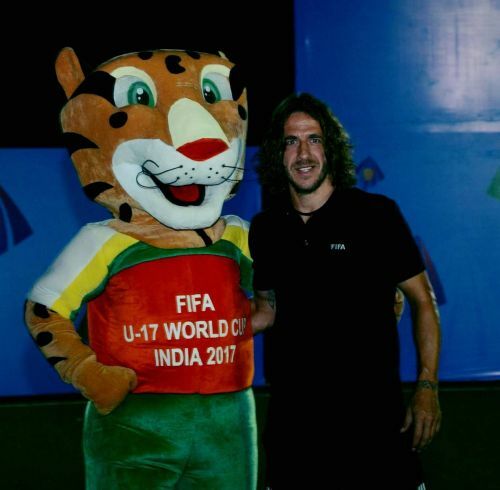 With FIFA’s support (post our persistence and convincing of course), we managed to bring to India FIFA World Cup Winner Carles Puyol to hand over the first FIFA U-17 World Cup India 2017 ticket to a descendant of the team captain of the Mohan Bagan Athletic Club team that beat East Yorkshire Regiment in 1911 (first Indian side to beat the Englishmen at their own game) to lift the IFA Shield. Weaving in subtle yet effective stories like this allowed us to capture the attention of the media as well as stick to our focus i.e.- football. Giving further significance to the story, we announced that the limited online sale of tickets would go live at 19:11 on 16th May 2017. 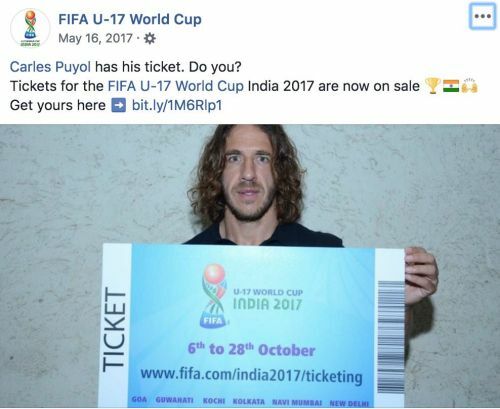 Leading up to the evening of the launch we maximised Puyol’s time in the country by engaging our key online and broadcast stakeholders by first having him go live on Facebook followed by him being part of the IPL semi-final pre-show live broadcast on Sony. Tickets go up on our site and the site goes down! In retrospect, a good problem to have but at the time – a Head of Marketing’s nightmare. Of course, we did resolve the issues and made sure the same did not happen again during the launch of any other phase. 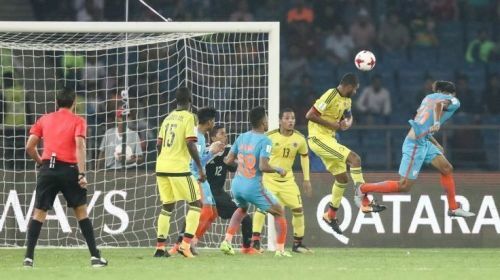 That being said it did happen again but only once when we had to move a semi-final from Guwahati to Kolkata and fill sixty thousand plus seats in less than forty-eight hours (a story for another time). 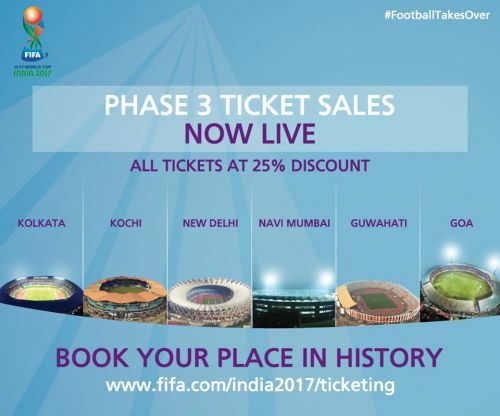 It is important to note that our ticketing plan was in-line with FIFA’s strategy used globally and with our on-ground knowledge of the local market, we adapted the plan according to what we felt will work in India. Even though no other sporting event in the country releases tickets for sale five months in advance, we were confident of our plan leading up to that point as well as the way we had structured the phases. The limited release of tickets in each phase allowed us room for course correction if required but as you know by now, it all sold out. In my opinion, pricing was the most critical component to make it all a success – both in selling tickets as well as reaching our budgeted revenue target of $1.2 million. We ensured that in our first phase itself, people were able to purchase a single game ticket at INR 80 (under $2). In this phase, the name of the game was scarcity coupled with social proof and likeability. All our communication, whether it was for volunteers to register or for tickets going on sale, we made sure it seemed (but was actually the case as well) like there were only limited spots or tickets that were up for grabs. 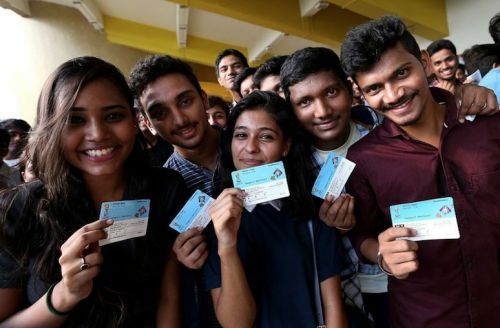 So much so that we even managed to get Government bodies and partners to purchase tickets in a hurry when the reality in India is that they expect to receive them for free. The conversations (amongst youth) on social media itself with regards to the volunteer program, ticketing and our young energetic mascot served as a great testament to establish consensus amongst peers that this is a tournament they would like to be part of in any possible way. For the last phase and of course the most exciting one, we tirelessly went about attempting to pull out all the big guns starting with our first tournament related live television broadcast – the Official Draw. 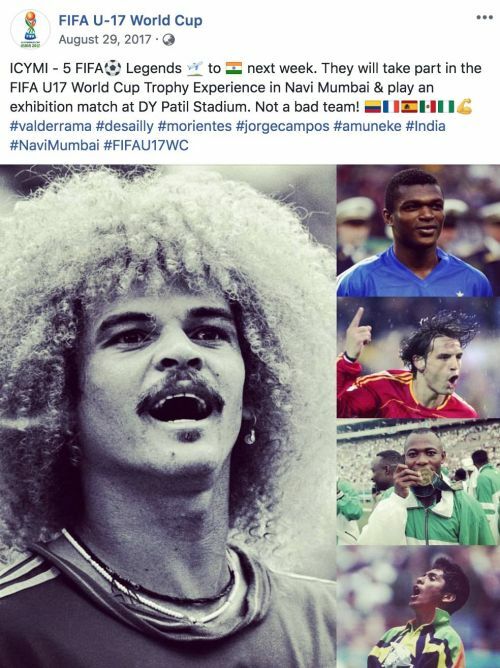 An event that had past U-17 World Cup Winner Kanu alongside Champions League Winner Cambiasso and our very own national team captain Sunil Chhetri and a special guest, Olympic silver medallist PV Sindhu. The night was capped with the release of the catchy Official Song (composed by Pritam Chakraborty). Ticket sales kicked into overdrive since we now knew which cities would be hosting which teams. ‘Book Your Place In History’ was our messaging during this phase hoping that football would take over and capture the imagination of a nation. It did! The events that followed were the Trophy Experience that allowed us to showcase the Winner’s Trophy across all six host cities and was received with more media and local interest than expected. These events too were played out in such a way that they were perceived to be a ‘once in a lifetime opportunity’ for anyone to be part of. Many of the Trophy Experience days were combined with Mission Eleven Million football festivals that continued to add value to the young football loving students. Don't miss my wide smile in the background. Happy that the trophy is still upright. With 30 days to go before the tournament kicked-off, we managed to pull-off a Legend’s match that was a conversation of much debate between us and FIFA prior to it all getting finalised. For us, it was something that would hold immense media value as well as stick to our ‘football focus’ and at the same time give the fans a teaser like none other, before they experience the real thing in a few weeks. The stories and drama we managed to build on and off the field with all the five legends and their time before arriving as well as in India led to a huge boost for us in terms of ticket sales as well as coverage regarding the tournament. Much of the activity in the last few weeks was ensuring that all our key Government and commercial stakeholders put all their might behind the final push to promote the tournament by decorating the host cities (example – approximately $1.3 million spent by West Bengal for promotions across radio, television and outdoor) and engaging their immediate audiences (example – Bank of Baroda reaching out to their clients and branches nationally to participate in World Cup-related activity as well as marketing a ‘Kheleo’ branded debit card for kids). All of which led to a house-full first match attended by the Prime Minister and continued with un-relenting support from fans (even though India did not make it past the group stage) to cap the tournament with an even stronger sense of national pride. This last phase allowed us to capitalise on one thing. From the start of our journey to get to this point we were always committed to the fact that this tournament would be like none other and we remained consistent in our messaging of football being the focus and winner over anything else. There is always a fine line between hoping to stay consistent and actually doing so but we can be proud of the fact we managed the latter and many can learn from this experience going forward. The one million mark breached with 6 days to go. It is safe to say that when you look back at a plan that worked, it is a success in its own right but what is really important to know from an outsider’s perspective is that to achieve something of this scale it can only be done ‘together’ and together with an honest selfless motive. At the end of it all, every single stakeholder had and still has the right to give themselves a pat on the back. Well-deserved indeed.